My new book Between Migdol and the Sea (2014) argues strongly in favor of the historicity of the Hebrew Exodus from Egypt. A large group of Semitic Shasu really did depart from New Kingdom Egypt, make their way across the Sinai wilderness, and invade Canaan. Their recollections of that experience are contained in the biblical book of Exodus. The population estimate of “millions of Israelites” is wildly incorrect. This number throws off everything else. Because bloggers and Wikipedia editors think they have to find traces of millions of people, naturally the Exodus tale seems far-fetched. Chapter 8 calculates a total population of 36,000 using four proxy measures of the Hebrew population found in the biblical text. The revised number is much more in accord with historical realities of Egypt and Canaan during the Late Bronze Age. If you read of someone discussing “millions of Israelites” who allegedly took part in the Exodus from Egypt, that person is not a serious scholar. Archaeology has limitations. Archaeology is not the only window into the past. One puzzle of the Sinai wandering is the apparent lack of remains from the Hebrew passage through the wilderness. However, as Professor Kenneth Kitchen points out, “tented wanderers like the Hebrews (and others) have commonly left no surviving traces.” (Reliability Old Testament 2003, p. 191) Migdol Chapter 9, p. 218-219, provides an additional example drawn from my own travel in the Colorado wilderness. Archaeology is neither the only nor the final word on ancient history. Literature, geography, demographics, genetics, physics, chemistry, and even coastal oceanography all have much to say about history. A combination of disciplines provides the most reliable approach to evaluate the historicity of the Exodus. I make this recommendation throughout Between Migdol and the Sea. Israel Finkelstein and Neil Silberman are fine sources as archaeologists, but their handling of the Old Testament as literature is poor. Kitchen agrees with me (Reliability 2003, p. 464). For example, F&S claim that “the Genesis stories revolve (mainly) around Judah” (Unearthed p. 44, 46), and this idea forms a substantial part of their Josiah Hypothesis. But their claim is not correct. The Genesis stories revolve around Jacob/Israel, Abraham, and then Joseph in that order. Judah the Patriarch comes in at a distant tenth (Migdol 2014, p. 225-227). Exodus 1:11 reports that the Hebrew workers built the store-cities of Pithom and Raamses. Pithom and Pi-Rameses (modern Tell el-Retabeh and Qantir) were indeed occupied during the New Kingdom reign of Pharaoh Rameses II (Hoffmeier Sinai 2005, p. 57, 64)(Kitchen Reliability 2003, p. 257, 256). The city of Pi-Rameses flourished from about 1270-1120 BC, after which Tanis replaced it in prominence. These and other examples (Migdol, p. 245-249) show an accurate knowledge of Egypt during the Ramesside period that would be very difficult to obtain in Jerusalem during the reign of King Josiah (~620 BC). 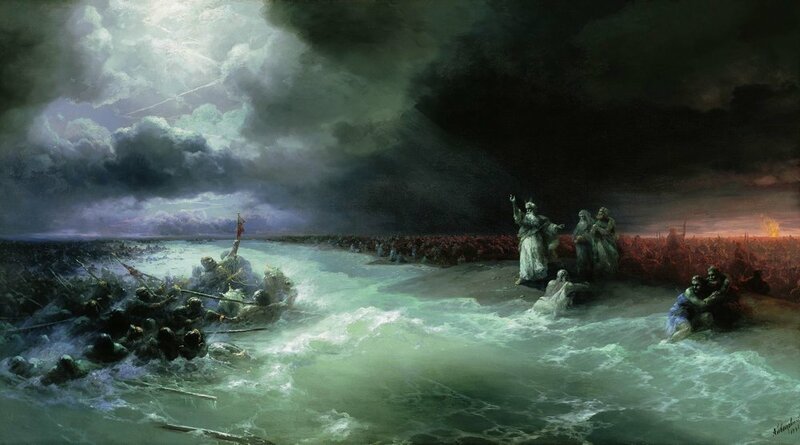 Passage of the Jews through the Red Sea, 1891 painting by Ivan Aivazovsky. Between Migdol and the Sea Chapter 3 presents a history of researchers and non-scientists who realized (with some surprise) that the crossing narrative in Exodus 14 matches a weather event known as wind setdown. Chapters 4 and 5 describe how my own research revealed more details of the Israelites’ escape through the Red Sea (Hebrew yam suf), including a likely site at Tell Kedua in the eastern Nile delta. Exodus 14 is an accurate description of a wind setdown event. Migdol Chapter 10 notes that the Kedua Gap is about the only spot where the waters could divide. What is an accurate account of a rare weather event doing in a Bronze Age text? The simplest explanation is that someone was near the Migdol cluster of forts and observed it happen. For this tale to make it to Canaan, someone had to depart from Egypt and take the story with them. That is an Exodus. Obviously there is much more detail in Between Migdol and the Sea than the summary provided here. The book includes a list of 167 References, many of them to scientific and scholarly publications. For readers of Funmurphys: the Blog who are interested in the Hebrew Exodus from Egypt, this book will give you plenty of solid information to consider. It makes a great Christmas present!